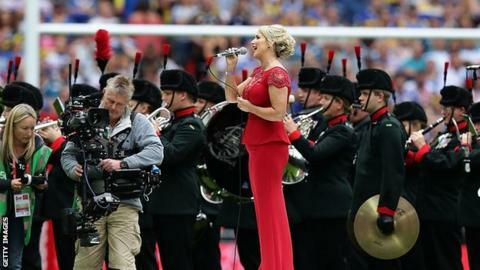 BBC's Songs of Praise is searching for supporters to sing in the Rugby League Challenge Cup Fans' Choir at Wembley. A 32-strong choir will be selected from supporters representing clubs in this season's Challenge Cup to sing 'Abide With Me' before the final on 27 August. Applicants can enter by visiting bbc.co.uk/songsofpraise and have until Sunday, 12 June to do so. The judging panel will include Songs of Praise presenter Aled Jones and Leeds Rhinos player James Jones-Buchanan. West End star Connie Fisher and Lizzie Jones - who sang before last year's final in memory of husband Danny Jones - are also on the panel. Songs of Praise producer Matthew Napier said: "We want to hear your uplifting and unusual stories about supporting your club and why you think you deserve a place representing your team in the Rugby League Challenge Cup Fans' Choir."